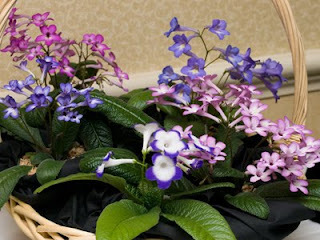 SECTION H - Collections of Gesneriads - A grouping of 3 to 5 different plants in flower or grown for ornamental qualities, or in combination (Saintpaulias must be in flower). Exhibitor must provide a white card (not to exceed 8-1/2"◊11") with identification of plants. In Class 46, exhibitor is encouraged to reflect variety as this is a consideration in judging. In Class 47, exhibitor must provide educational information on the card. Entry No. 203, Collection of Streptocarpus, exhibited by Lee Stradley. Score: 93. First Place. Entry No. 439, Sinningia Collection, exhibited by Charlene Marietti. Score: 83. Second Place. Entry No. 228, Collection of Sinningias, exhibited by David Zaitlin. Score: 82. Third Place.